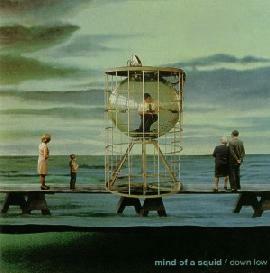 Mind of a Squid - "Down Low"
Odd that they would name their album Down Low, because Toronto’s Mind of a Squid fly high, with astounding, tripped out space rock. Combining drifting, pulsing shoegaze style guitars with a deliciously Ry Cooder-like twang to them and liquid bubbling Moog synth, Erik “The Atomic Cosmonaut” Culp and his band of cohorts, Marina Adam on Rhodes piano and vocals, Scott Bucsis on bass, and Blas “Dr. B” Melissari on drums and percussion, blast onto the scene with a fantastic debut release. Things kick off with the amusingly titled Honky Tonk Blues Part II. There doesn’t seem to be a part I, and there’s nothing here that sounds remotely like honky tonk blues. Never mind, it’s a dazzling epic that careens through ghostly ambient space excursions, ethereal vocal parts, and pulsating guitar and drum jams. I was reminded a little of Architectural Metaphor in their sound, especially when Marina Adam began to sing, her delicate yet powerful voice reminiscent of Deb Young’s. From that stellar opening, the band race effortlessly through dreamy, cosmic instrumentals like the hypnotic The Mollusc and the three-part space voyage Bridge I/Seven Suns/Bridge II, to melodic, tripped out vocal tracks like the towering Way Down Low and the dark and dreamy Nug. Things stay predominately mellow, but the band is not afraid to rock out either, with Culp pounding out power riffs or playing gorgeous, soaring solos, and the rhythm section of Bucsis and Melissari often exploring complex, progressive territory. The heavier parts creep up on you though, and take you by surprise, emerging from the laid-back dreaminess like a sudden storm before drifting off towards the horizon. The album finishes off with one of its best tracks, the elegant and flowing Doesn’t Look Good, featuring a vocal performance from Marina Adam that will send shivers up your spine, and a languid, jangling instrumental coda that drifts off into deep space with a hazy Moog solo and spaced out guitar. It left me breathless. Fans of Architectural Metaphor, or some of the more instrumentally inclined exploratory music of Porcupine Tree are sure to groove to this terrific album. I know it’s going to make my Top 10 List for 2003. For more info, explore the Mind of a Squid on the net at: http://www.mindofasquid.com.